LOUISVILLE, Ky. (Aug. 21, 2013) — The ground floor of a parking garage might seem an unlikely research lab, but for students at the University of Louisville J.B. Speed School of Engineering, it has been an ideal location to conduct research on vehicles powered by alternative energy. Speed students modified a hybrid Prius to be a plug-in. It serves as one test bed for the school’s research. Undergraduate and graduate students are looking for ways to make electric-powered cars more practical to use for both consumers and businesses. The research platforms at the Floyd Street garage include four GE charging stations with Physical Plant’s electric Chevrolet Volts attached and a Toyota Prius hybrid modified with a battery pack to be a plug-in. Two charging stations at the Physical Plant office and faculty-owned electric vehicles further extend the test bed. The research is only a small part of all that the Speed School is conducting in alternative energy, said John Naber, professor in the Department of Electrical and Computer Engineering (ECE). 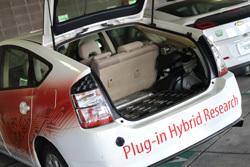 Senior engineering students modified the hybrid Prius by installing a 20-battery pack and plug-in conversion kit. For two years, the school has used the vehicle for the undergraduate capstone experience, said Michael McIntyre, ECE assistant professor. Projects have included performance assessments before and after modification and development of a battery management system that could, among other functions, cut off the system if necessary. “It is a project-rich environment,” McIntyre said of the car. ECE master’s student Joe Latham is using the Prius to continue his undergraduate research. As an undergraduate, Latham develop a sensor to use with the battery pack. Now his focus is developing an algorithm to use the data from the sensor to determine state of charge and state of health of in the individual batteries. If one battery were to fail in that pack, performance might diminish, he said, but even worse, a failed battery could ignite. For safety reasons, the car’s driver needs to know when one of them is failing, Latham said. Doctoral student Nick Jewell is studying a different aspect of electric-powered cars. Jewell is developing a system to regulate UofL’s charging stations during peak demand times so their use doesn’t increase the university’s electricity demand. Large users of electricity in Louisville pay both a peak demand charge and an actual energy charge, and the demand charges can be more than half of a typical monthly electric bill, Naber explained.